I am not seeing general category page when logged into this forum. I can post if I copy and paste from a page where I am not logged in or click on unread posts. I messaged the admin yesterday who seemed to have ignored it. It is happening in more than one browser and computer. Just wondering if anyone else is having the same problem. I have not received a message from you. Everything looks to be ok on the server side. 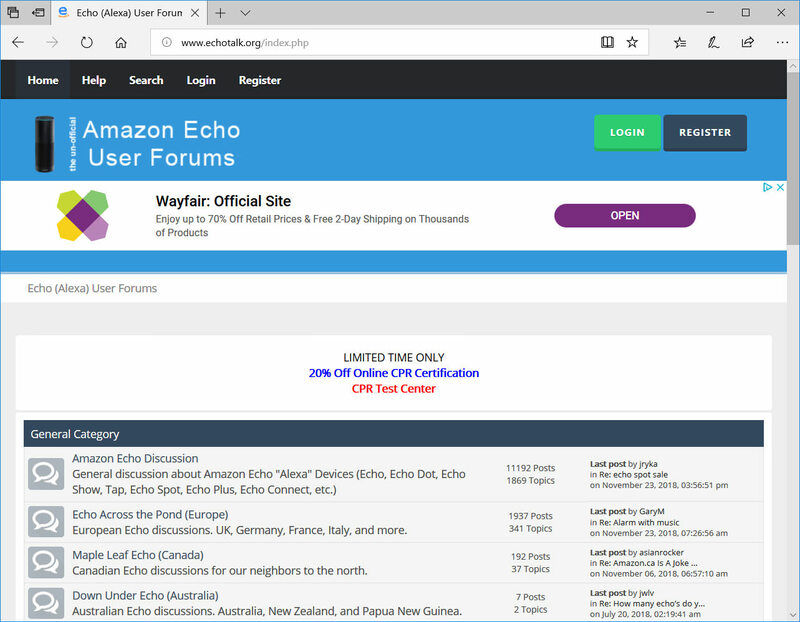 The main index page at http://echotalk.org should look like the screenshot below. By the way, if you are using the https version of the site, it won't work correctly. You should use the http: site instead. Although the https certificate is setup and valid, the forum software does not support it, yet. This has been an ongoing issue with the developers of the SMF forum software. I wish they'd get their act together and support https. If for some reason the messaging system isn't working, just post your findings in this thread. By the way, if you accidentally clicked the +/- icon on the right side of the General Category header bar, it expands/collapses the entire category page. This is saved in your account so the setting is loaded when you login, regardless of what device you use. First example: The General Category is expanded and you can see all of it. Second example: The General Category is collapsed and none of it is shown. just checked my sent messages and it was not there. I remember doing one, maybe forgot to hit send. whatever the case, sorry about that. was just getting frustrated and now a bit of embarrassment too. as far as that minus and plus sign, it turned out it was related to that. It showed the minus with no categories. so I did a plus then did the minus again and it worked. trying to figured out what caused the problem since it happened only after logging in. maybe a corrupted temp file on my end though it does not make sense with it happening to both firefox and chrome. oh well, just another reason to call today black friday.